The Australian dollar has recovered to 0.7200 neighborhood, managing to recover some of its early lost ground. Looking at the technical picture, what can AUDUSD traders expect next? 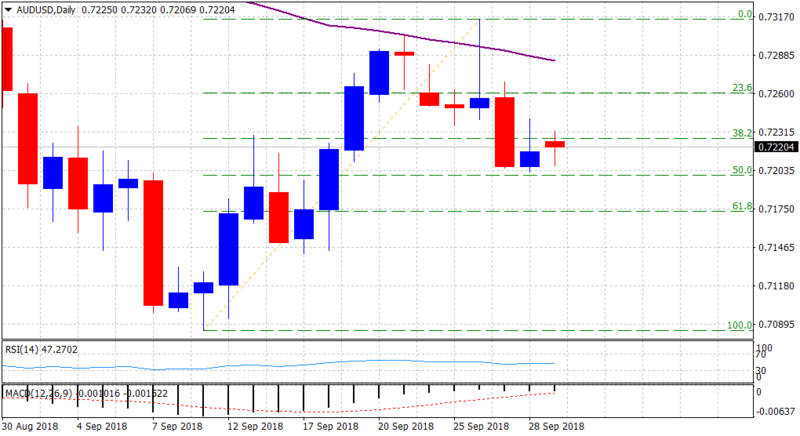 1 October, GKFX – With investors looking past the latest disappointment from Chinese manufacturing PMI, a mildly softer tone around the US Dollar was seen as one of the key factors extending some support to the China-proxy Australian Dollar. However, the USD downtick remained limited amid a fresh leg of an upsurge in the US Treasury bond yields. Adding to this, the ongoing bearish slide in copper prices undermined demand for commodity-linked currencies - like the Aussie and further collaborated towards keeping a lid on any meaningful up-move. Moving ahead, traders now look forward to the release of US ISM manufacturing PMI for some short-term trading opportunities later during the early North-American session. This coupled with a slew of influential US macroeconomic releases, scheduled at the start of a new month - including the keenly watched NFP, will play an important role in determining the pair's next leg of directional move. Looking at the technical picture, the pair last week struggled to sustain above 50-day SMA/the 0.7300 handle but seems to have found a decent support near 50% Fibonacci retracement level of the 0.7085-0.7315 up-move. With technical indicators on the daily chart holding in neutral territory, traders are likely to wait for a decisive break through the mentioned range before positioning for the pair's next leg of directional move.